The Tiguan engine delivers 200 horsepower and 207 pound-feet of torque, giving it a lively feel. 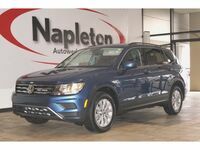 The 2.0-liter turbocharged four-cylinder TSI engine provides plenty of power for this crossover to accelerate with ease. All the fun of driving a manual without the hassle of working a clutch is found with the six-seepd transmission with Tiptronic. The EPA-estimated 21 city/26 highway mpg rating is just as expected for an SUV with the power of the Tiguan. Families enjoy 23.8 cubic feet of cargo space with the rear seats upright and 56.1 cubif feet with the seats folded flat. Standard features include heated side mirrors, 16” Portland wheels, Bluetooth with audio, rearview camera and a ouchscreen sound system. The SUV segment expanded so quickly that automakers seem to have quickly lost sight of what makes it so appealing. Consumers want a spacious vehicle that can fit all the gear their families need, but also offers superb comfort for family road trips or outdoor adventures. 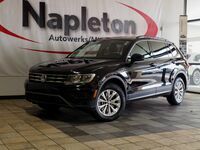 Enter the 2015 Volkswagen Tiguan Springfield MO, which not only satisfies the practical needs of modern drivers, but brings fun into the fold. 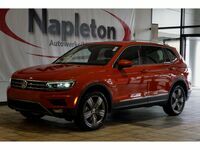 The powerful 200 horsepower 2.0-liter turbocharged inline four-cylinder engine reminds drivers that an SUV should offer a responsive driving style that doesn’t bog down on the highway, while the smaller crossover design of the Tiguan ensures a car-like grace that makes handing easy on the driver. The Volkswagen Tiguan comes in 2.0T and R-Line 2.0T models, with 10 total trims between the two. The Volkswagen 4Motion all-wheel-drive system is available across the board, giving shoppers worried about traction added peace of mind, while also conserving on fuel as the system retains a front-wheel drive efficiency until traction is needed. Combine the powerful engine with the standard six-speed automatic transmission with Tiptronic, Sport mode and Dynamic Shift Program for the ultimate feeling of control as the driving modes give control of the transmission over to the driver without requiring a clutch. Finding fun behind the wheel may have much to do with an agile model that provides a great experience day after day, but excellent features only add to the experience. 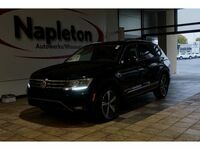 The 2015 Volkswagen Tiguan near Lebanon MO in nearby Springfield doesn’t disappoint, having heated side mirrors, 16” Portland wheels, Bluetooth with audio, a rearview camera, a touchscreen sound system, Climatic climate control, multi-function steering wheel and woven fabric upholstery as standard features. Those seeking more will find available features include Volkswagen Car-Net, V-Tex leatherette upholstery, a panoramic sunroof, keyless access with push-button start, touchscreen navigation, dual-zone climate control and the Fender premium audio system. For those concerned about the practical side in buying a crossover, plenty of cargo space can be found in the Volkswagen Tiguan, with 23.8 cubic feet of cargo space with the rear seats upright and 56.1 cubic feet with the rear seats folded. Safety features are include traction and stability control, antilock disc brakes, front side airbags and full-length side curtain airbags to keep families safe. Think the 2015 Volkswagen Tiguan may be the right choice for your lifestyle? Contact the friendly staff here at Napleton Volkswagen Springfield to find out how you can get behind the wheel of one.